Charadium from On5 is a lovely and addictive iPhone game that brings an online multiplayer version of Pictionary and Charades to the 21st century. Almost everyone has played this game, one time or another at a party, where you draw something on a board, and everyone has to guess the word it represents. Charadium (orange in a coconut, yummy) is a perfect blend of the game for your iPhone or iPod touch. In real life, you play this in teams, but in Charadium you play solo vs. a group of six or more color coded online players. You’re given a word or phrase and have a few seconds to decide. Tap the green button to start drawing, or tap the red area to skip to the next player in the room. You get points both for guessing correctly and for drawing pictures that result in correct guesses. As a drawer, you draw on a white canvas using your fingers and can change brush colors to really get creative. I noticed some really talented artists in the Charadium rooms that drew some amazing stuff in less than 5 seconds that blew my mind. You can erase your drawing if you need to start over, and redo and undo as well. But the main part is making sure guessers get the word before time runs out as illustrated by a tiny colored bar that shrinks on top of the screen. As a guesser you see the drawing updated in real-time and have a keyboard that you can type in your guess. You see all other guesses as well, which can help you eliminate some of your wrong ideas! If the timer gets close to then end, letters in the word start to appear one by one as hints to guessers. I just really love when developers inject personality into their apps, and Charadium has tons of it. For example when you’re the last person in a room, Charadium pops up a message saying “You are alone in the room. There is no point anymore.” You can share your game results of Facebook, Twitter, via Email or by going to Charadium.com and enter your room code given to you in the app. Amazingly enough, the website gamelog has stats on all the players in the room along with screenshots of each drawing. Games are 15 rounds, each round taking about 1 minute. You can also play a quick round if you wish. Playing Charadium requires that you sign up for a Plus+ account to store your profile, or login with your existing one. Options let you turn off the sound alerts, which are super tolerable, and enable/disable Autocorrection. You can also change your language from English to Spanish, French, German, Italian, Portugese and more. To leave the room, tilt your iPhone and an exit icon appears on the top right. What’s nice however is if you accidentally close the app, and reopen it, you’ll get logged in the room you were in automatically. Tap on a player to add them to your friend list, so you can play them one on one later. There are few online playing gems in the App Store, and Charadium is one of them. 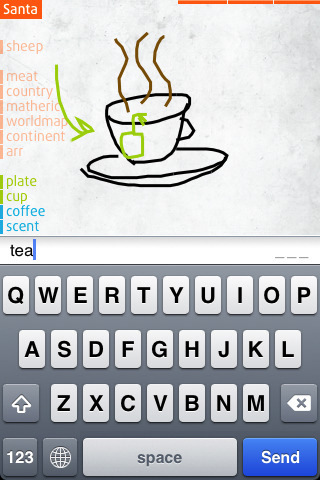 If you’re an artist, love to draw or just love playing pictionary type games, Charadium is an absolute must have. Brilliant graphics, fast online multiplayer gaming, a wonderfully designed complementary website, and at 99 cents, Charadium easily gets a 5 star rating from Appsafari. AppSafari review of Charadium was written by Joe Seifi on March 19th, 2010 and categorized under App Store, Featured, Games, Multiplayer, Time Management. Page viewed 4132 times, 2 so far today. Need help on using these apps? Please read the Help Page.